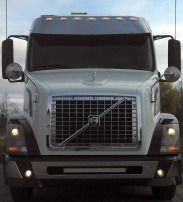 This shows the creative options that you have on new trucks with split bumpers. 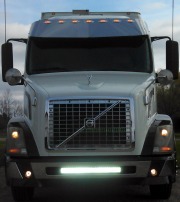 This new Volvo semi tractor has all the bells and whistles from the factory, and now has a super bright LED light bar to add to the unique look! This is the new Volvo that Stud Boy will be using this winter and we got them hooked up with our new Brite Lites Xtreme Off-Road Double Row LED light bar. It is the 32" long model and throws a whopping 11,400 lumins to help see just about anything! The pics help show the stealthy custom mount in the bumper shell and how much light this throws in the daylight. Just think of how much it gives off at night!! 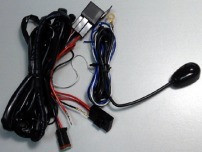 We also have all the accessories to make the install complete. 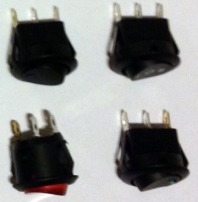 We have 4 different in dash round rocker switches if you don't care for our push button switch on the wiring harness, and we have the Light Bar connectors in both Male & Female so you can use these to totally customize your wiring harness needs for as many lights as you are adding to your ride! Sleekly mounted in the opening of the bumper - makes it look totally factory and Bad to the Bone!! LED Light Bar Lit Up!! With this on you can about peel paint off the car in front of you! Or at least have a good chance of melting the ice at 60 mph! !